Submitted by Dmitri Davydov on Sat, 2016-01-30 17:33. I originally wrote this article for TheNextWeb almost two years ago. I am ready to write another one that’s going to be titled ‘Why We No Longer Pitch Techcrunch’. I just though it would be a good idea for my Medium readers to learn about what PR strategies we’ve used in the past and what has changed since (hint: A LOT). PR is hard. And expensive. Most of the time, you get nothing out of it. And when your company finally is mentioned in an article, even in a big publication, the results can be disappointing. One time, we got a whooping 169 visitors after being covered by ZDNet. Over the past two years, I’ve made a lot of PR mistakes. I’ve also got Bitrix24 into Forbes, VentureBeat, ReadWrite, PCWorld, PCMag, TechRepublic, CIO, ITWorld and 200+ other tech publications. I’ve learned that what you do with the article after it’s published is frequently a lot more important than what do you before. And I am happy to share my insights with you. LinkedIn Inmail is the cheapest and most effective way to pitch journalists. My account cost me $100 a month and at least 50 percent of all mentions of Bitrix24 in the press are results of LinkedIn pitches. The most amazing thing about LinkedIn is that once you find one or two journalists, their network will actually show you who else to contact –editors in the same or other publications. It saves you a lot of time. With Inmail, the results are guaranteed. You pay only for those messages that got read by their recipients. Publishing industry is about pageviews?—?that’s how advertising is sold. To get pageviews, you need content. To get content, you need journalists. To have enough journalists in the world to cover the vast tech industry, you need to pay them. That’s exactly why many popular publication now have guest blogger and contributor sections. After you get to know most editors who cover your niche, you should start following their Twitter accounts. When you see a tweet that you can meaningfully respond to or comment on, do so. If you consistently comment and retweet someone’s account for a couple of months, they’ll start noticing. Now you can pitch. I’ve found that the best way to do this is with a question. The same data can be presented in multiple formats?—?report, infographics, slideshare presentation, webinar, video and so on. Last Christmas we did a report about social intranet use. We first pitched it as a study that got picked up by major tech publications, like ReadWrite. We then released infographics based on the same data and got a score of mentions again. I now know that I should also include podcast and videocast friendly materials in my pitches (you can’t easily show infographics in a podcast, and podcasters are almost universally overlooked). We’ve got mentioned in Forbes twice, both times by contributors. One article had 50,000+ views within the first week. Another one got less than 2500 views in the same period of time. Why the difference? Reddit and StumbleUpon. Your corporate Twitter and Facebook are a given. Submit articles that mention your product or service to Digg, Reddit, Delicious and other free content amplification tools to drive more traffic to them. You won’t always have 100 percent success rate, but when your articles get picked up by Reddit or StumbleUpon, the results are amazing. If you can’t get your content amplified for free, don’t worry, there are affordable services like Outbrain (what we use) or Taboola that let you buy amplification. There are several instances when using them makes sense. Some publications rank articles according to pageviews. By driving traffic to your article, you get more pageviews, ranking it higher. Another instance is when your old article got tapped out and is buried so deep no one can see it. Let’s face it?—?Google likes Forbes.com a lot better than your company site or ours. You can use that to your advantage. For hyper-competitive phrases like ‘productivity tools’ or ‘collaboration tools’ where our own website has no chance of getting to the front page results, we use SEO (links with anchor text and social media mentions) to improve ranking of articles that mention Bitrix24. Not only it’s easier to improve search engine results page (SERP) results for high authority domain, people trust publications a lot more than vendors sites. When we launched the service, we decided to make it free to startups for a year, but journalists weren’t interested in covering this. So we changed our PR pitch to Bitrix24 announces $1.2 million grant program for startups. That minor tweak made all the difference. 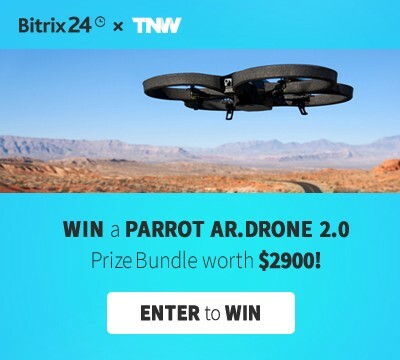 We also routinely partner with other publications for giveaways (most recently, we raffled away a Parrot AR.Drone to TNW readers). Many publications are happy to promote your giveaways for free, but the advantage of giveaways is that you can run them all year round, and not wait for a new release or major product update to contact editors. There are two ways to get onto lists. First way is to find a year-old article and contact the author, asking if he or she is planning an update. That’s how we got onto PCMag’s Best Free Web Apps list. Another way is to impress a guest blogger to get them to put you in a list, which can extend to placements in a myriad of websites. The best thing about them is that lists beget lists. When I see our service mentioned on a list that I did not solicit, most of the time I know which older list was used as an inspiration. I try to mention as many other tools and services when promoting Bitrix24 as possible, even when these services partially compete with us. Most social media managers are happy to retweet any article that mentions their brand. A lot of time they’ll link to the article from their website or social media pages too. The more qualified traffic, the better! There are actually a lot more techniques that we used to improve Bitrix24 visibility and drive traffic to our website. Through these strategies, we’ve increased our ROI by more than 10X after we dumped our last PR agency. Unless we are running a big promotion, our PR related expenses are around $500 a month, and we get 10 to 20 new articles mentioning Bitrix24 during a typical 30-day period. Our last agency cost us $7,000 a month and delivered no results. First, contact journalists directly via social media with short pitches, not press releases, and try developing relationships with them over time. Second, keep looking for new formats, because you aren’t Google and nobody cares about your new release. Third, develop a solid post publication strategy to squeeze out as much traffic from each article as possible. Finally, concentrate on ‘grassroot PR’ activities that improve your chances of being mentioned in media, without you pitching them directly. Good luck!